Bringing it all Together ~ History and Physics unite! It is important to understand a little about the history of the broadcast industry to understand it’s effects on the atmosphere. Once you understand the path of energy and the historic use of these frequencies you can really begin to see the pattern clearly. Through researching not only the atmospheric and plasma physics but the history of broadcast and spending time analyzing specific broadcast towers and their frequency propagation paths in relation to gyrofrequency maps helps in understanding that one transmitter means little to this process, however global trends in this evolving technology may potentially affect climate change through the EEP-NOx/ozone depletion process and subsequent UV heating of atmospheric GHGs. So around 1909/10 we first began broadcasting electromagnetic energy in the VLF range for it's ability to propagate signals across land and sea which has been shown to transfer it’s energy to the Ionosphere stimulating electron precipitation > EEP-NOx causing ozone depletion, increased GHG heating from increased UV and a rise in global temperature. In 1917 – 1919 WWI brought about government regulation and nearly all AM broadcast ventures and equipment were halted and confiscated. 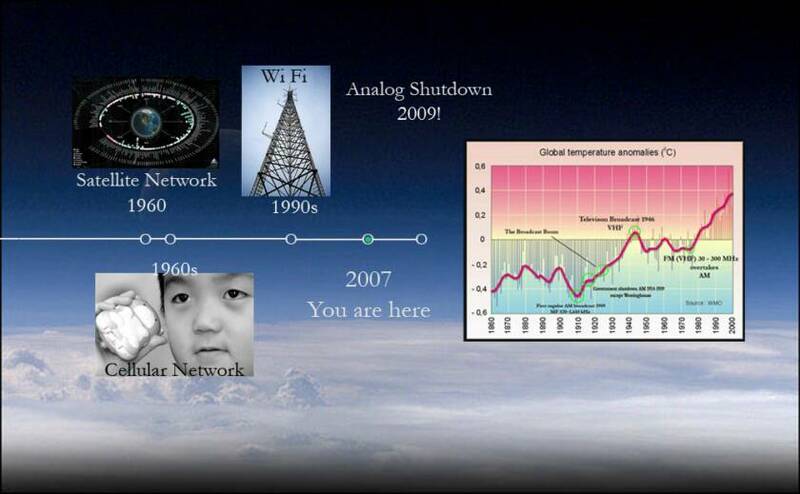 The only station that was allowed to remain on was Westinghouse, due to the drop in broadcast input the EEP-NOx process may have equalized with the rate at which the ozone is created in the Chapman Cycle, this can be seen as it levels out in the global temperature graph. In 1919 – 1925 the war restrictions were off and a Broadcast Boom occurred. In 1921 there was 1 regular broadcast station and by March of 1923 there were 556 stations licensed. Radio grew explosively between 1921 and 1926, with the biggest part of the boom between 1922 and 1925. Newspapers and department stores started broadcasting and advertising. The Netherlands, Argentina and other countries followed suit as it began to spread across the globe allowing VLF and AM Transmitter Induced EEP-NOx process to deplete ozone again, this can be seen in the global temperature anomalies graph as the EEP-NOx process caused ozone depletion resulting in temperature increase. During the 30’s the antennae design changed from flattop to vertical, this propagates less skywave, thus less EEP-NOx. Television was just being discovered when WWII began which halted it’s development. In 1946/47 WWII was ending and during this time control of the airwaves was still a complicated issue with many new problems arising which led to an overhaul of the broadcast system between new FM and television frequency allocations, other than AM Apex stations closing AM stayed the same. Although television became commercially available in the late 30’s, it wasn't until after the war and the FCC’s frequency re-allocation that television broadcasting really took off, with new television transmitters being built all over the United States. 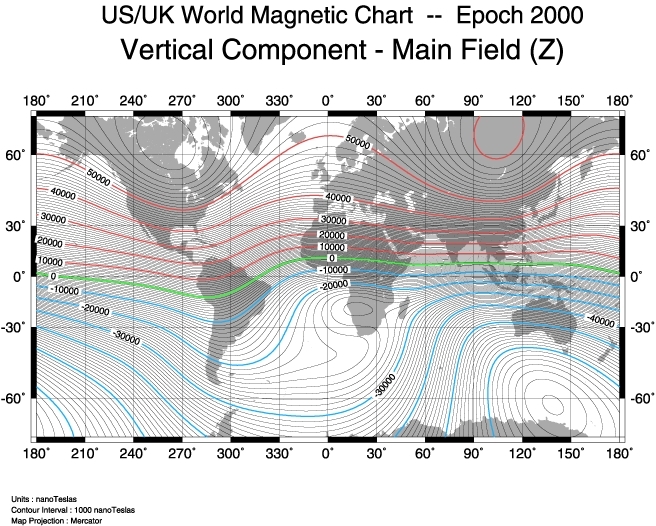 Also during 1946 the UK war restrictions on broadcast lifted resulting in a television broadcast boom and caused the tropospheric ducting of UK television signals which were received around the world, that together with the US resulted in the largest frequency shift of man made radio wave propagation ever to occur in the ionosphere. This was the first time in nature for this to happen. This resulted in a massive electron density shift in the ionosphere and polar regions which can be seen in weather records and ocean oscillation cycles. Television operates in a frequency band that has been shown through experiments at HAARP to cause a suppression of Electrostatic Ion Cyclotron plasma wave ducting and the EEP-NOx process. These higher frequencies disrupt the ion acoustic turbulence along magnetic field lines, the path that cyclotron plasma waves require to stimulate the EEP-NOx process, thus the process equalized with the natural Chapman Cycle and a reduced ozone depletion rate. During this time it took approximately five years for the global temperature to slip into a lower equilibrium and it remained here for many years until the effects of the solar proton events rose above the continued, albeit lower, effects of the AM Transmitter Induced EEP-NOx process. But there is another complex process that is going on here. Electromagnetic transmitters stimulate two particle anomalies according to experiments at HARRP and EISCAT scientific transmitter facilities. Up until now we have been talking about electron precipitation and now we will discuss the effects of AM broadcast on ion outflow from the ionosphere. O+ Ion outflow is stimulated by AM broadcast at the same time as part of the same process. Both electrons and O+ ions (mostly oxygen) spiral through the wave guide of the magnetic field line toward the polar regions. As the magnetic field lines come closer to earth at the polar region the cyclotron plasma waves amplify. Waves crossing the flux tubes connecting the open and closed magnetospheric field lines change the parallel/perpendicular force that the radiation belt electrons use to mirror them back to the conjugate hemisphere. This changes flux tube morphology and increases the Flux Transfer Events (FTE) allowing more radiation belt particles to interact with the lower atmosphere. As AM broadcast causes the EEP-NOx process and O+ ion outflow to increase, these O+ particles have been observed to flow up the Interplanetary Magnetic Fieldlines (IMF) – open- lines or the closed field lines of the radiation belt which leads to ozone depletion in the conjugate hemisphere. Scientists have observed this outflow and have also observed O+ ion gas injections into the convective zone of the sun. The two are simple one an the same as it takes 11-12 years for the particles to reach the convective region where the electrons are eager to equalize the polarity and leap to the O+ ion gas which increases sunspot activity throwing energy back at the planet that further depletes ozone. This accumulated in solar cycle 19, the largest unpredicted solar cycle on record. The conductive circuit of the sun earth connection is played out in the ion chemistry of the independent systems. This accumulated to solar cycle 19, the largest unpredicted solar cycle on record. The conductive circuit of the sun - earth connection is played out in the ion chemistry of the independent systems. There is much more to this process involving backscatter of energy off the solar photosphere that can cause kink instability resulting in a delta sunspot and the increase of electrons and ion flow in the solar wind resonating with the cyclotron maser resulting in the heating of protons, thus leading solar proton events. This will be detailed further in the future. 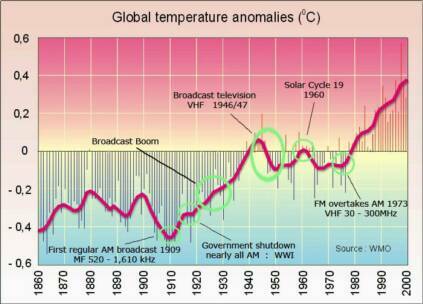 The current rise in temperature began in the 70’s when FM broadcast overtook AM. Although the AM cyclotron energy is blocked by television broadcast due to the disruption of the ion acoustic turbulence along the magnetic field line, the input is still there. It is trapped and has nowhere to go, so the electron density builds until it releases periodically through a flux tube transfer with the F layer. Yet this energy has to cross the conductive bridge of the E valley before it gets to the F layer. This is like a huge gap in electron density. Once FM came on it increased the electron density between the E & F layers allowing the AM cyclotron energy to flow over the gap. This frequency jump is called a Luxembourg effect and is well understood as a cross modulation of signals that result in a higher frequency, thus resulting in the cyclotron maser beams (~2.45GHz) observed in the F layer of the ionosphere. This once again fuels the EEP-NOx process and allows the global temperature to rise. Above the Greenland ice sheet in the earth – ionosphere – magnetosphere coupling there is a powerful interaction going on, especially along the gyrofrequency line due to the input from both the US and the UK broadcast. This input combined increases the electron density and O+ ions in the auroral electro jet and polar cusp region. The ice reflects much solar radiation and thus provides another powerful path for cyclotron plasma instability. The chemical reactions are guided by the electronegativity as the oxidation and ionization rates of the ozone layer as well as the hydrodynamic equilibrium are disrupted. This may also have effects on the high and low pressure zones in this region. This is a primary zone for energy exchange with the radiation belts where flux transfer events with the closed magnetic field lines radiate energy to the conjugate hemisphere. Due to an increase input in the Northern hemisphere it drives the irradiation to the southern hemisphere where the energy fuels the ‘polynya’ phenomena. This increase in electron density allows more interaction with cosmic rays resulting in a high flux of neutrinos in this region. Here is the study that details this. They mention the cause being of anthropogenic origin, specifically VHF related. Keep in mind that much of what we have assumed is ‘natural’ has been in the thick of radio pollution since 1909, while we are just learning to measure some of the processes that have been occurring for the last century. Conclusion: We separated ourselves from nature long ago. Another major factor to all this is the position at which the United States sits geographically according to the electron gyrofrequency and the magnetic field lines. We are in a zone of compact magnetic field lines below the aroural electrojet that expands as you travel northward to the East and West. As we have seen with gyrotropic and electrostatic ion cyclotron waves traveling through the ionosphere, they intensify as the magnetic field moves further north. This means that any activity on the gyrofrequency is going to magnify as they move north east toward Scandanavia across the Atlantic Ocean of which is a VERY effective waveguide to frequencies. In 1946 they knew nothing about the electron gyrofrequency and took no measures to ensure that we didn’t effect them. All they knew is that they would willingly give up channel 2 to avoid interference on the second harmonic of the amateur radio band. With the reallocation of the broadcast band after the war all FM radios from before the war became obsolete, this and television hindered the development of FM radio which wouldn’t make it’s final triumph till the mid to late 70’s and this too can be seen in the temperature graph. 2016/2017: "Anthropogenic Space Weather" is now a term coined and used by MIT & NASA scientists. TIPER: Transmitter Induced Electron Precipitation EEP is a term according to VLF Stanford Group. Satellite readings have shown we've created a VLF bubble around our planet! EEP-NOx is one of the hottest topics in atmospheric physics according to HEPPA-SOLARIS climate modeling workshop based on NCAR and WACCM-X climate models. EEP has been linked to not only the hottest region of climate warming in the Southern Hemisphere. 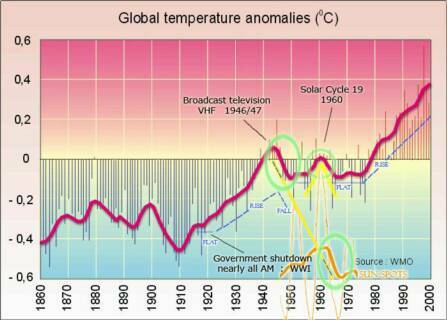 But also the origin of the climate warming trend in the Northern Hemisphere under the auroral electrojet starting in 1910.. about the time of first broadcast. Transmitter Induced Electrostatic Ion Cyclotron waves are a solid part of Radiation Belt Remediation schemes. Electromagnetic Ion Cyclotron waves have been observed heating solar protons well into the solar wind. Satellites have observed areas of ionospheric plasma turbulence over major populated areas of broadcast usage. Radiation Belt Remediation RBR schemes involve using Electrostatic Ion Cyclotron frequencies and satellite based generation of plasma wave turbulence to remove Van Allen radiation belt electrons to mitigate potentially harmful radiation risk to satellites, what considerations have been made for potential ozone losses to the EEP-NOx process? 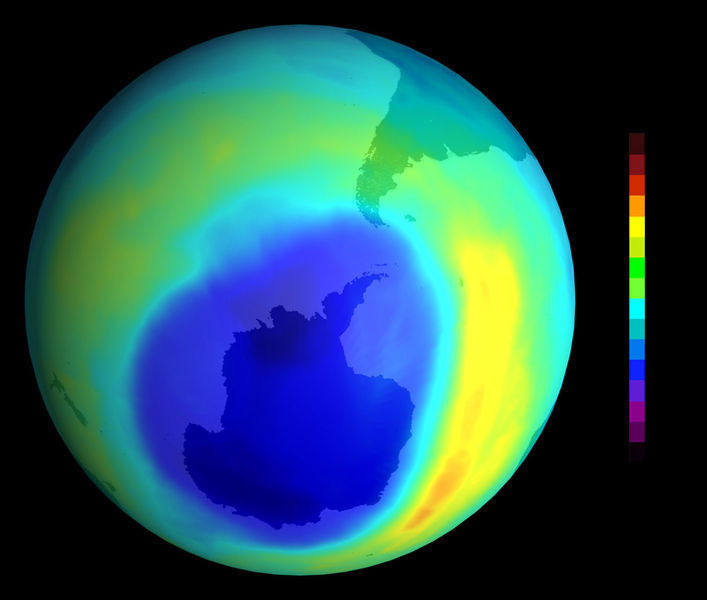 If the VLF bubble (3rd radiation belt) is a good thing to protect the earth from solar proton events, what considerations have been made to avoid ozone losses to the EEP-NOx process?